Please select an option 6 7 8 9 10 11 Please select a ringsize. 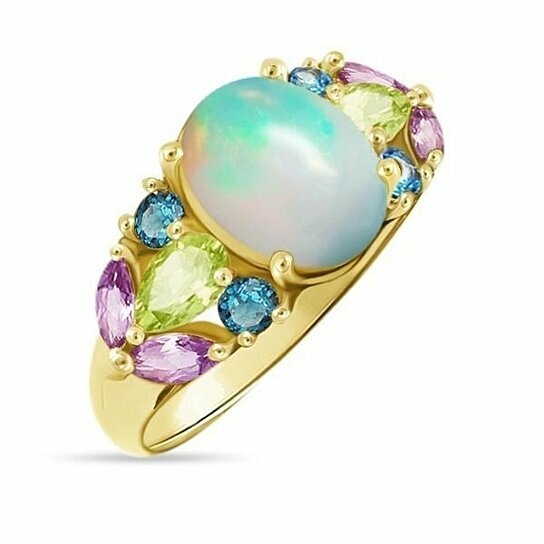 An exquisite multi-gemstone ring featuring a 3 carat Ethiopian Opal in the center, this ring is studded with 11 gemstones of varied colors. It is an artisanal design boasting opal, blue topaz, peridot and amethyst made to perfection. The gold plating on 925 purity Sterling Silver will make the shine last forever! Each gemstone adds more than a pretty pop to your ring. Amethyst tones your crown chakra to make you intuitive while London Blue Topaz awakens the throat chakra to make you confident. On the other hand, peridot raises your higher heart chakra to make you lucky and the central opal fills you with creativity and imagination! A geometric design that dances under light like aurora borealis, this opal multi-stone ring is designed to beautify your hands. Pair this to your next party or tomorrow at work, you will look like the Queen of elegance. Take a soft bristle brush. Dip the tip of the brush in warm water. Scrub the ring with the brush. Repeat it 1-2 times in every three months. Take your ring in the left hand. Hold a selenite wand with your right hand. Hover the wand thrice in a clockwise direction over the hand with the ring in it. Do it before and after every use. DISCLAIMER: Please understand that every gemstone is different in size, shape, and color. The one you see in the picture might not be the one you receive as gemstones are unique. We believe every gemstone finds its way to the person who needs it; it’s bound to be special!